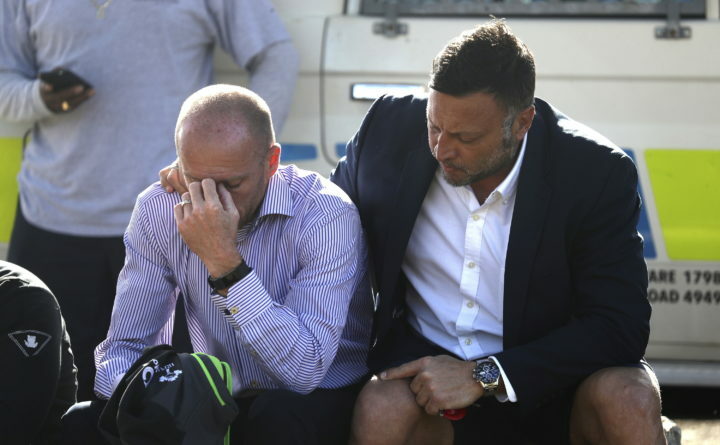 Tom Healy, left, the Bermuda national rugby coach and organizer of an international rugby tournament in Bermuda, is consoled by former rugby player Harry Andrews after police confirmed they found the body of American college student Mark Dombroski in Hamilton, Bermuda, Monday, March 19, 2018. Dombroski, 19, a member of the rugby team at Saint Joseph's University in Philadelphia, disappeared early Sunday after a night of socializing at the end of the tournament. PHILADELPHIA — The search for a St. Joseph’s University freshman who was reported missing in Bermuda over the weekend ended Monday afternoon when his body was found in a moat outside a historic fort, police said. Several hundred St. Joseph’s students and staff members learned of 19-year-old Mark Dombroski’s death at the university’s chapel, where they had gathered to pray for his safe return. As the vigil ended, many of those who poured out cried and embraced one another. Dombroski, of Media, traveled to the British island territory last week for a rugby tournament with other members of the St. Joseph’s team. He was last seen on video footage at 1:15 a.m. Sunday about a mile and a half from a bar he had left an hour earlier. James Howard, acting assistant commissioner of Bermuda Police Services, said foul play had not been ruled out. He said an autopsy would be performed to determine a cause of death. Dombroski’s body was found in a wooded area less than 300 yards from a police station and about a half-mile from the stadium where the tournament was held. “We continue to appeal for witnesses and anyone with information on the last known whereabouts of 19-year-old Mark Dombroski,” Howard said. Police said Dombroski did not appear to have been inebriated when he went missing. Police said Dombroski had been with teammates at the Dog House, a bar on the waterfront in Hamilton, Bermuda’s capital. He left shortly after midnight. At 1:09 a.m. he was spotted nearby on surveillance camera video. At 1:15 a.m. another camera recorded him using his cellphone on Middle Road, about 1.5 miles from the Dog House, police said. His family reported him missing at 9:39 a.m. Sunday. The family was scheduled to return home later that day. The search was extensive. Police said they checked every public CCTV on the 20.5-square-mile island. A marine unit searched Hamilton’s harbor. Two teams fanned out over the Bermuda Arboretum, a 22-acre national park. Civilians donated drones to the cause. Eleven members of the St. Joseph’s rugby team, one coach, and four parents traveled to the island on Wednesday for the Ariel Re Bermuda International 7’s Tournament. The Philadelphia university has participated in the tournament for the last several years. Matches are held in the National Sports Centre, just outside Hamilton. St. Joseph’s officials learned that Dombroski was missing about 10:15 a.m. Sunday. The team’s coach stayed to help in the search efforts while the rest of the team returned to Philadelphia on Sunday. After Monday’s vigil at the university, 19-year-old Nick Filardo, a freshman, struggled to fight back the tears. He said he knew Dombroski through his roommate, a rugby player. “Mark was just a really positive kid,” he said. Mark C. Reed, the university’s president, said Monday had “been a day of hoping and praying and worrying, not just as a college president … but also as a parent.” He said the chapel would remain open and counseling services would be available to students.